Here we are again. Another day as a nerd, another day where people are upset about something. Go ahead, browse the internet for a couple of minutes. You’ll find a bevy of topics that have fellow nerds in a constant state of outrage today. Some, are justified. Some though, are the addiction that is the mob mentality of the internet. One person sparks the outrage and others follow. If the person sparking said outrage has a decent following and is respected by their followers, then logic goes out the window. Take cover, because the hate is going to spread like Simian Flu. The amount of “Africans” in Black Panther, Marvel Legacy, the DC event, Metal, take your pick. So, today, on Peace, Love, and Comics, I’m continuing the positive conversation about only things I love. Which is why this piece and this series is named, “Why I Love.” I know, I’m a wordsmith beyond my years. In all honesty though, this is one of my favorite things I’ve ever written. There are so many things to love about nerd culture and more specifically, comic books. It’s the main reason I embraced the culture at such a young age. You can develop a unique sense of self in this culture. You can really be whoever you want to be. I’ve written three pieces so far in this series. The first, was about The new Green Lanterns, Simon Baz and Jessica Cruz. The second was about the man I line up with the most ideologically in comics, Matt Murdock. The third, was about one of my favorite Batman stories and objectively, one of the best as well; Batman: HUSH. All three of these things in comics mean different things to me. Whether it’s how I relate to them, their powers, or the great structure of the plot. Today though, I want to talk about a group of heroes that mean something to not just me, but the entire comic book industry. The introduction of this team, the quality of their stories, and the fact they are some of the most respected members in the Marvel Universe, makes this team iconic. They’re good “For the Culture,” as we like to say. I’m talking about the newest version of Marvel’s Ultimates. Blue Marvel, Spectrum, America Chavez, Black Panther, and Captain Marvel. Who are the Ultimates? Well, if you haven’t read this new series but are thinking of the Ultimate universe, I have two things to say to you. 1. The Ultimate Universe doesn’t exist anymore (kind of) 2. Shame on you, this comic is some of the highest quality that Marvel is putting out. This version of the Ultimates is the normal Marvel Universe’s attempt at creating a new, diverse team. And boy, are they diverse. Never in my life as a nerd did I think that the best team in Marvel wouldn’t have a white male as the lead. You read that correctly. There are no white males on this team. Never did I ever think Marvel would spotlight minorities in such a way, and it’s the first reason I love this team. Today, and for very good reason, people are demanding diversity and representation in all forms of media. Every story that can be told through a white man’s perspective has been told. Good story is good story to me, but I have a hard time watching films or reading comics with absolutely zero diversity. On the flipside of that, over the past few years, some of the diverse titles that Marvel has put out have been cancelled. Black Panther and the Crew, World of Wakanda, Mockingbird, Nighthawk, and Mosaic. Why though? The demand is clearly there. Marvel has people all across social media telling them, “This is what the people want.” Marvel delivers and the numbers aren’t great. Why? The answers are fairly simple. The first being that the racist or conservative comic book fans, who still make up a good portion readers, would never buy anything like that anyway. If Geoff Johns or Scott Snyder says Nighthawk is a great story, then maybe more people pick it up, but those types of readers aren’t thinking about checking out diverse titles on their own, that’s just a fact. The second, is that the people demanding, aren’t buying. I know, right? There aren’t no theories necessary to try and figure this out. Not many are supporting. I refuse to berate people not buying though, I just ask that before you are hyper critical of Marvel specifically for their efforts in diversity, check your pull list each week. Don’t have a pull list? Research on how to assemble one. Don’t read comics? You have a right to be upset, but don’t be upset if your screams go unheard by the community. So, since diversity is a big topic today, Marvel answered the call with this team. I love that because this is also one of, if not, the most powerful teams in the Marvel Universe. Let’s start with the old man himself, Adam Brashear. The Ultimates roster is one of the best in Marvel. The next reason I love this team is the roster. Let’s start with Dr. Adam Brashear. Don’t know who he is? That’s fine, he’s a fairly new hero. Brashear is an old man, he’s close to 90 years old. He’s one of the smartest men in the Marvel universe. Adam is a war veteran and became the Blue Marvel during an experiment. His powers? He’s a living antimatter reactor. Crazy, right? Blue Marvel’s powers came from his attempts trying to harness power from the negative zone. The reactor in his lab exploded giving him his powers, one of which is limited aging. Antimatter is interesting stuff and I would recommend you read up on it if you’re not too familiar. The purpose of his experiment was clean, usable energy for the world. His former military peers wanted to use it for nuclear weapons, so I guess it’s a good thing he’s the living antimatter reactor. His powers make him one of the strongest in all of comics. He’s battled heroes such as Hyperion, Sentry, Hulk, and many more. If you look up his powers, he has just about everything there is along with his molecular powers. It’s also stated that the limits of his strength are unknown. I don’t think there’s any limits to what he can do. When’s the last time we were able to say that about a black male character? I think a solo is in his future but him being on this team was plenty for me. Even without his powers, Adam is an honorable man. He’s faced the brutal racism of the 60’s and was one of the first superheroes in America. For the most part, he’s a conservative man with a love of his country, but he never lets his humanity escape him. The next character I want to talk about that’s paired with him in terms of powerset and invincibility is Monica Rambeau aka Spectrum. Spectrum used to be Captain Marvel at a time in the comics. But she goes by Spectrum now and it fits her because it’s representative of her powers. Monica is living light. She can become any type of energy on the electromagnetic spectrum. Gamma rays, X-rays, infrared lights, electricity, anything. And if you didn’t read that correctly, she actually becomes the energy she chooses. She doesn’t just emit it from her body. She gains all properties of whatever energy she decides to become. That’s only two characters on the Ultimates and already they seem overpowered. Just like Blue Marvel, Monica is more than her powers though. During the Ultimates comics, she doesn’t get the spotlight as much as I would like, but she isn’t a side character either. Al Ewing does a great job with all of these characters during this epic story. Monica is considered to be an expert tactician. She’s lead the Avengers before and is a respected hero in the Marvel Universe. Ewing puts this team to the test though because the whole concept of the Ultimates is to solve problems before they become problems. I’ll get into more of that later, but all that basically means is sometimes, this team handles things that are out of their reach, even though they have the intellect to recognize problems others don’t. Heroes in the Marvel Universe are used to being vulnerable, but this story took that to another level. There’s a beautiful moment between Adam and Monica where Adam has to remind Monica that she’s human. Yes, he and her are two of the farthest things from human, but they still have human thoughts and human reactions. Monica is distraught, she feels as if it was her plan that brought on the failure. He continues to utter the words in her ear, “We’re human.” It’s a beautiful moment for a couple of reasons. The main one being this connection was established even before the Ultimates comic. They teamed up in the Mighty Avengers relaunch a while back, which was also written by Ewing. The second reason is because a lot of Monica’s development in this story is around her being connected to a higher power. The fact the she is living energy means she can achieve a higher sense of reality, or something much different, than any human, super or not, can. She’s trying to reach her full potential. And who’s trying to help her reach it? You guessed it, Adam Brashear himself. He’s a scientist first. He sees life as an experiment. Science to him, is discovering the magic in the world, the beauty in the madness. Science to Adam is seeing the inner beauty that makes everything work, and understanding why we fall in love with it. Monica represents his love of science in theory and reality. But, I said in the last paragraph, through it all, he doesn’t lose his humanity. He reminds Monica of her flaws, her human flaws, and tells her that it makes her just as beautiful as her powers and her status. More so actually. They share a passionate kiss at the end and as a reader, it felt well-earned. Spectrum is a great character and I’d pay good money to see more moments like this from Monica. The powerhouse of the Ultimates is up next. That’s right, I’m talking about America Chavez. She’s a newer character as well but has skyrocketed in popularity because she’s such a cool character. Every team needs a wildcard, right? She’s that for the Ultimates in a way, but not in a traditional sense. She doesn’t crack jokes or make extremely irrational decisions. She’s the one in the group who has the least connections to anyone. Partly because of her superhero profession, but also because it’s her choice. America was raised by two mothers in a different reality where she gets her powers from a cosmic deity. When her dimension was in jeopardy, her family sacrificed themselves to save their reality and left America alone at just six years old. She was forced to mature quickly. America ended up becoming the “paramedic of the multiverse.” She saves different realities from horrific fates. Even though she’s young, America has seen so much. Tony Stark becoming the next Hitler? An Earth-2020 where Egypt is the world’s dominant superpower? A reality with nothing but beasts that worship Ben Grimm? Whatever loopy reality you can conjure up in your head, America has probably seen some sort of manifestation of that reality in real life. She’s a hardened character. She doesn’t trust many people and only joins the Ultimates originally in case she must shut them down. This story actually starts with America. I said that Ewing gives each hero their moment, and America’s comes first. 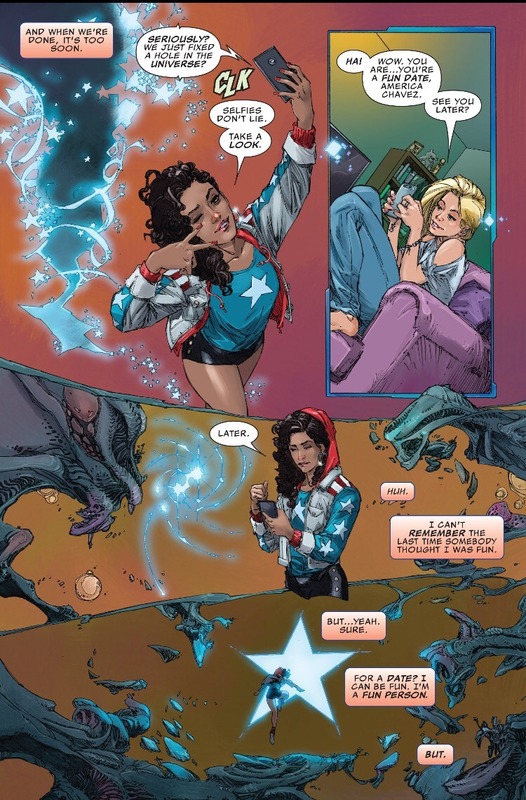 In the opening of the Ultimates, she’s assisting Black Panther with closing a rip in space-time that’s allowing beasts from a different reality to invade. America has superhuman strength, speed, and durability. She also creates portals that are shaped liked stars. It allows her to teleport to any universe she wants to. They don’t call her the paramedic of the multiverse for nothing. Black Panther knows how tough she is so he calls America to help him. America talks about how she had to break a date for this with a girl named Lisa. America ends up calling Lisa and they have a small dance party over the phone. The energy from Lisa allows America to close the gap and seal space-time. It was a cool opening moment and it was also her “audition” into the Ultimates. America isn’t one for words too often. She speaks when she needs too and acts when she needs too. One of the best moments in Ultimates was when she started to beat on Captain Marvel during the Civil War II storyline. I don’t want to get into that story too much, but basically, Captain Marvel had turned the Ultimates into a government organization and not the cosmic team they were meant to be. This didn’t sit well with Blue Marvel and it really didn’t sit well with America. 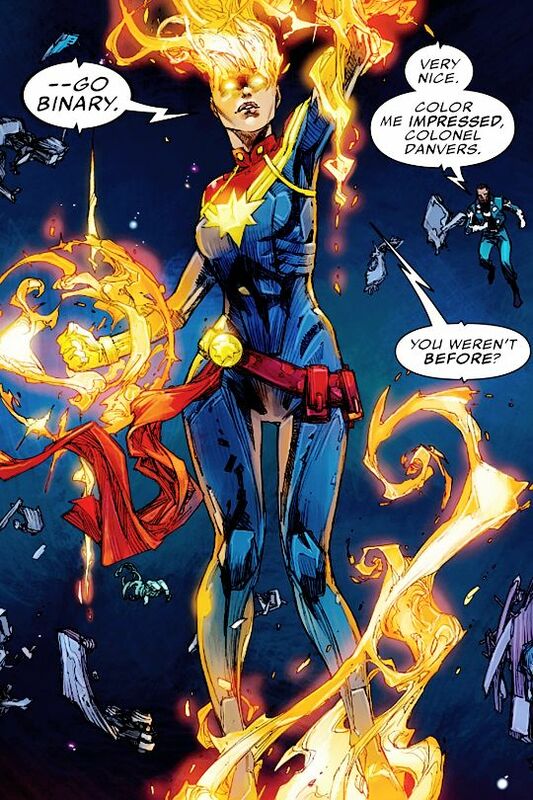 She picked up a chair and hit Captain Marvel and began to fight with the other Ultimates. Well, except Black Panther. He just stood there, not a care in the world. It was a funny scene, but a great character moment for America and it made me love her even more than I already did. She has a solo series out right now too. I recommend reading it to form your own opinion, but I read the first two issues and didn’t mind it. Some don’t like it, and it’s because it’s a very different America from the Ultimates comics. Still, she’s a great character that’s here to stay for years to come. I didn’t want to spend too much time talking about Captain Marvel and Black Panther, the last two team members. Most of us know Carol Danvers and T’Challa. Starting the Ultimates was Carol’s idea and T’Challa agreed to help and bring in Adam Brashear. Carol Danvers has been a rising star in Marvel ever since she assumed the title of Captain Marvel. She’s a celebrity in the Marvel Universe and Brie Larson is playing her in the upcoming film, so I can only imagine she’ll become a megastar in our world too. She’s a headstrong leader who’s the liaison for humanity. She associates with Alpha Flight and is the face of the superheroes in most instances in the Marvel Universe. Her reputation has taken a hit, in her world and ours with the events of Civil War II, but she’s still a vastly important figure. She may have been marketed as the leader of this team, but it didn’t play out that way to me. Sure, sometimes she liked to take charge, but so did Blue Marvel, so did Black Panther, and so did America. This comic wasn’t about team leaders or egos. They were tackling bigger issues throughout the entire story. T’Challa is already becoming a superstar in our world. His movie comes out next February and it looks like it’s going to be the best Marvel film to date. He’s a genius, a warrior, and a diplomat. He’s probably the most respected man in the Marvel Universe and his presence on this team enhances it drastically. It was him and Blue Marvel who even came up with the missions the Ultimates decided to tackle. He has some great moments in this comic. Ewing knows how to bring out all the different sides of T’Challa. He’s one of those characters that has so many strengths, he can almost come off as boring. But, Ewing does a good job of making the King of Wakanda interesting. I know this piece has been character heavy. I meant it to be. I wouldn’t have picked up this comic if the team was average. I absolutely love cosmic stories and science fiction, but the team has to be great for me to pick up a team comic. This story though, has so many implications on the entire Marvel Universe. It’s a cosmic story on a grand scale and I loved every second of it. 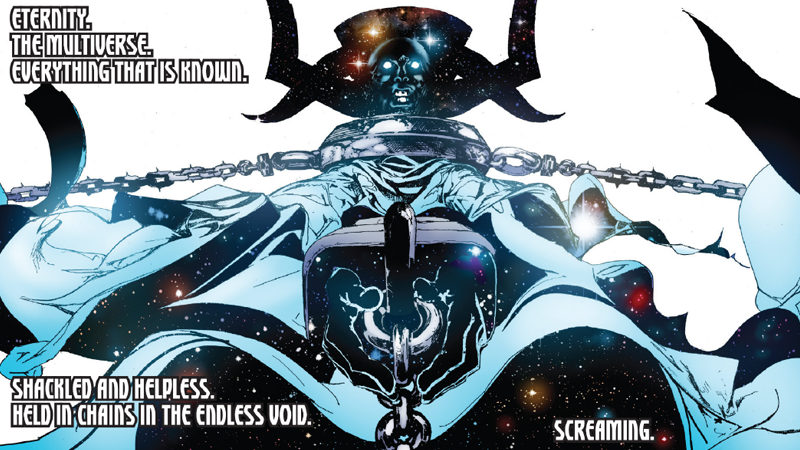 The first problem the team decides to solve is Galactus, the devourer of worlds. They decide to “cure” his hunger by placing him in the original chamber that caused his birth. Black Panther comes up with a plan to rewrite Galactus’ DNA so that he no longer hungers to kill planets, but rather bring life to them. And they succeed. Galactus becomes the lifebringer. That’s one hell of a task, but it’s nothing compared to bigger picture of this story. Time is broken. At least, that’s the theory Blue Marvel and Black Panther have come up with. The Ultimate Universe and the Marvel Universe converged during the event Secret Wars. That affected so many different areas of space and time. Blue Marvel and Black Panther conclude that these fluctuations in time can only happen for so long. That eventually, time itself will collapse under the pressure that humanity has put on it. So, to assess the damage, they decide to go outside of reality itself, outside of everything, to assess the damage to time. They are almost killed in the process though and guess who they find? Conner Sims, the AntiMan. He has cosmic powers just like Blue Marvel, in fact, they were best friends, but his powers have come with delusional visions as well. He constantly talks about a cage surrounding reality, which actually turns out to be Eternity itself. Eternity is an actual figure, representing everything that is. Eternity is chained and is caged. Galactus, as the lifebringer, brings in the Ultimates to help him in his quest to save Eternity from whoever has him chained. I know this all sounds crazy, but if weird science is your thing, you don’t want to miss out on this comic. I don’t want to even dive into the story anymore because there are some parts you just have to see and read for yourself. Diversity? Check. Great characters? Check. Compelling story and plot? Double check. Art? Check until about Ultimates2 #7 for me. But the first two trades were illustrated mainly by Kenneth Rocafort and the art is gorgeous. I hope you learned a little something about each of these characters today, mainly the newer ones, who aren’t in film yet. The Ultimates is one of Marvel’s best ideas in a long time. Unfortunately, this team suffered the event-fatigue fate during Civil War II. I didn’t hate Civil War II like some of my peers, but it did derail some important storylines. The Ultimates is the main one. It broke the team up and forced an unnecessary reboot in numbering. The story was flowing quite well and should have just continued without Civil War II, but that was almost inevitable seeing as Captain Marvel was one of the main players during Civil War II. Also, I hate to leave this piece about positivity on a negative note, but the Ultimates has reached its end. Marvel is doing a relaunch of their titles and are cancelling some. Ultimates seems to be one of them. That’s sad because everything in this piece indicates this team should be a mainstay in Marvel with a rotating roster throughout the years. Maybe it will happen again. Still, you can support this comic by buying the first two trade paperbacks along with the current run which is on issue #9 I believe. Everything fans scream for is in this comic. Everyone has their reasons for liking this story, but for me, it hits the mark everywhere. There’s so much more potential with this team but the sample that we got was astounding. As with all of my pieces, I hope you enjoyed it and I hope I was able to convey clearly why I love the Ultimates. Until next time. And remember, all the nonsense doesn’t matter at the end of the day. Read what you love, and love it with all your heart. Peace, Love, and Comics! !